We professionally install a vast range of Retail Solutions including Retail installations and Point of Purchase (POP installations) fixtures to support in-store marketing campaigns across any retail estate. From one-off flagship stores to campaigns involving thousands of retail outlets, we can deliver any kind of retail installation and build – from simple POS installations and POP siting to hi-tech interactive displays involving premium electronics and security equipment. Despite our size and international capabilities, CJ Retail Solutions offers a truly personal service across all campaign aspects of POS Installation and we take a consultative approach with any client enabling them to benefit from our vast retail solutions experience. CJ Retail Solutions has a nationwide field installation team who personally take your retail display kit and POS installation materials to every retail outlet on your schedule and ensure that they are correctly implemented just where you want them. 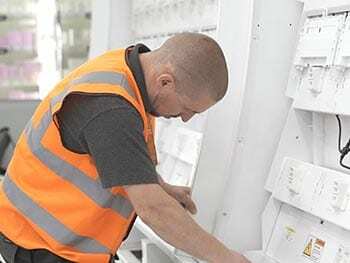 To support our installers, every single POS installation campaign is directed by a dedicated project manager who has worked closely with each client to define every aspect of the project delivery. If your installation involves out-of-hours and night work then you also get a dedicated night-shift project manager ensuring 24/7 support for any campaign. To maintain our exemplary SLA’s each member of our field installation team receives in-depth training on every aspect of the retail display project. Once the retail installation is complete, the installer uses our proprietary App to transmit detailed project records, including digital photographs and store management sign off, to your dedicated client portal using a smartphone. By monitoring and measuring every element in the process, we can achieve maximum compliance levels – indeed, we are the industry leader in this respect – which delivers improved brand visibility and maximum return on investment for our clients.